1. Kids are gross. There's just no getting around it. Pee, poop, snot, dirt. Everything in their mouths and then little sticky hands everywhere. It's a good thing they're so cute. Even when they sneeze in your face. 2. Texas Ruby Red grapefruit is so delicious. My grocery store had 15 lb. bags on sale last week for $5. $5!!! I couldn't pass it up, but that is a lot of grapefruit. If I can get motivated (see #2), I might try out a grapefruit pound cake recipe just for something different. 3. I signed up for a 5k a few weeks ago, and it's coming up on the 23rd. I'm excited! It's been a while since I've run a race. Not since moving to Texas, in fact, and I enjoy local 5ks a lot. This is a tad far from my house, but I couldn't find a more local one that fit my time table and schedule. 4. And speaking of running....I've almost reached a goal of mine that means I get to buy a couple of new running shirts. Yay running clothes! 5. And speaking of writing (wait...weren't we? Aren't we always), I've been putting it on my to-do list every day for the past few weeks and have managed it a couple of times (not counting a few of these blog posts...which I totally do, by the way). But I've got the seed of an idea for summer that might give me a little extra momentum. Too little to say out loud yet, but it's promising. 6. On my "nightstand": still reading (and enjoying) Storm Clouds Rolling In. I'd probably be finished by now, but got interrupted by some library holds coming in. Like Saint Anything, by Sarah Dessen, which just became available. Forcing me to choose between finishing or starting something new. I'm also still listening to my Brandon Sanderson audio, but had a slight interruption because of phone issues. That, and I've been spending my dishwashing/cooking time watching Star Trek: Voyager. I never managed to watch this show as regularly as others, so I am really enjoying this rewatch. And I had forgotten what a great captain Janeway is. Love her. This is the third book by Jojo Moyes that I've read, and with each book I finish it and just want more, more, more. When I read One Plus One, I was seven month pregnant working at church camp, and during rest time I'd end up happily reading instead of napping. I'm averaging about 5-6 hours of sleep a night these days, but I absolutely gobbled up After You, and stayed up way too late too many nights because I just couldn't stop myself (and by way to late, I mean...like 11 p.m. Which is super late for me these days). 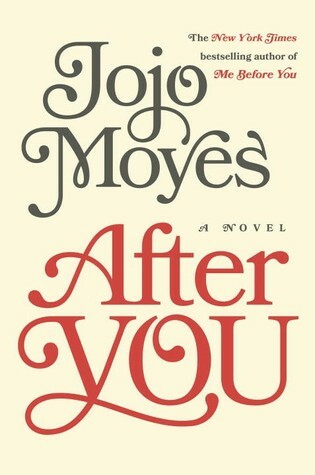 Anyway, After You is the sequel to the excellent Me Before You. After You picks up about a year after Me Before You ends, and we get to catch up with Lou, her family, and Will's parents. We see Lou stuck in a holding pattern. Her parents are navigating relationship changes, and her sister is trying hard to move ahead in life as a single mom. Will's mom is grieving quietly in a small village, and Will's father has married his pregnant mistress. Life tries to shake things up for Lou, first with a pretty serious accident, then with the appearance of Will's teenage daughter. A daughter Will never knew about, with a lot of anger, attitude, and something she's hiding. A girl who desperately wants to know the father she never had. In my opinion one of Moyes' strengths is her characterization. For example, Lou's parents are brilliantly written -- small-town people of a certain generation. The generation of traditional gender roles and Sunday dinners. On the flip side, Will's daughter is such a realistic teenager. Oblivious, self-involved, oblivious, and occasionally in possession of maturity and astounding insight. You want to smack her and at the same time give her a big hug and protect her. Like her other two books, After You is, at its core, about relationships and family. The family you choose and the family you don't. It's about grief, and change, and not being afraid, especially when you find those people who will have your back no matter what.